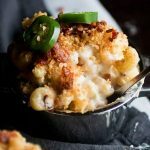 Simple but delicious jalapeño popper macaroni and cheese recipe. Set aside about half of your jalapeño slices to use as a garnish on the finished mac and cheese. Dice up the remaining jalapeño slices and set aside. You’ll need 1 heaping tablespoon of diced jalapeño for the cheese sauce (use more or less depending on your spice preferences). Cook bacon in the oven or on the stovetop until crispy. Remove to a paper-towel-lined plate and let cool, then dice into bacon-bit-sized pieces. Set aside. Cook pasta in very salty water until 2 minutes less than al dente. Drain and set aside. Return pasta pot to stove and melt butter over medium heat. Add 1 heaping tablespoon of the diced jalapeño to butter and sauté for 30 seconds, just until jalapeño begins to soften. Add flour to butter and whisk to form a roux. Cook for another 30 seconds. Slowly add milk to roux, whisking constantly to work out any lumps. Cook, whisking occasionally, until sauce has thickened, about 5-7 minutes. Whisk in salt and fresh ground pepper to taste. Add cream cheese to sauce and whisk until cream cheese has melted and sauce is smooth. Remove pot from heat and stir in shredded white cheddar cheese. Reserve about 1/5 of your bacon pieces for garnish. Stir the remaining bacon into cheese sauce. Add cooked pasta to sauce and stir to combine. Divide mac and cheese into individual baking dishes (this is what I did) or put it all in one large casserole dish. Set aside while you toast the bread crumbs. Add bread crumbs and stir to coat with the melted butter. Toast, stirring occasionally, for about 2 minutes until breadcrumbs have just barely started to brown. Remove from heat. Spread bread crumbs over mac and cheese in an even layer, then bake at 375 degrees F for 10-15 minutes until bread crumbs have browned up a bit more and pasta has just started to crisp up around the edges. Top mac and cheese with reserved bacon and jalapeño and serve immediately. If you can’t find white cheddar cheese, just use a regular sharp cheddar. This pasta has a nice kick to it – cut back on the jalapeño if you don’t love spicy food, or add a bit more pepper if you’re all about the spice! Omit the bacon if you’d like to make this dish vegetarian. Baking this mac and cheese is totally optional – if you’re not a fan of baked mac and cheese, just skip this step and serve it as stovetop mac and cheese!